Thankfully, I came across an Instamosaicstudio website, it has amazing gifting options for all your loved one. 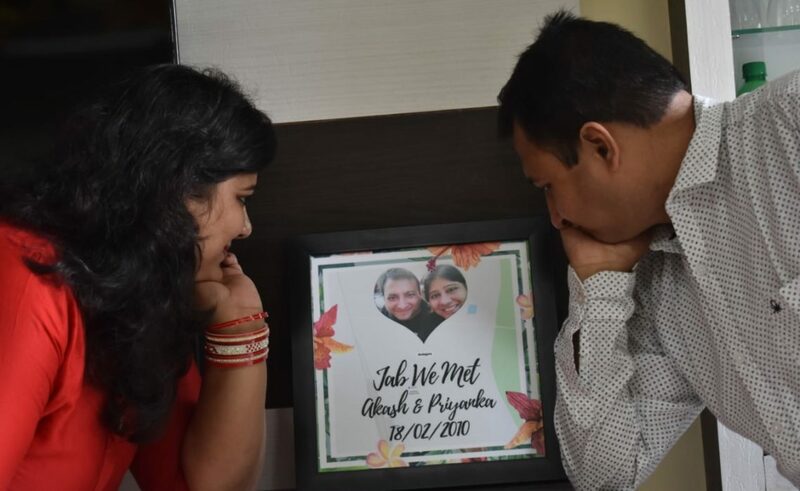 I opted for the Jab We Met photo frame, to gift my husband this anniversary. 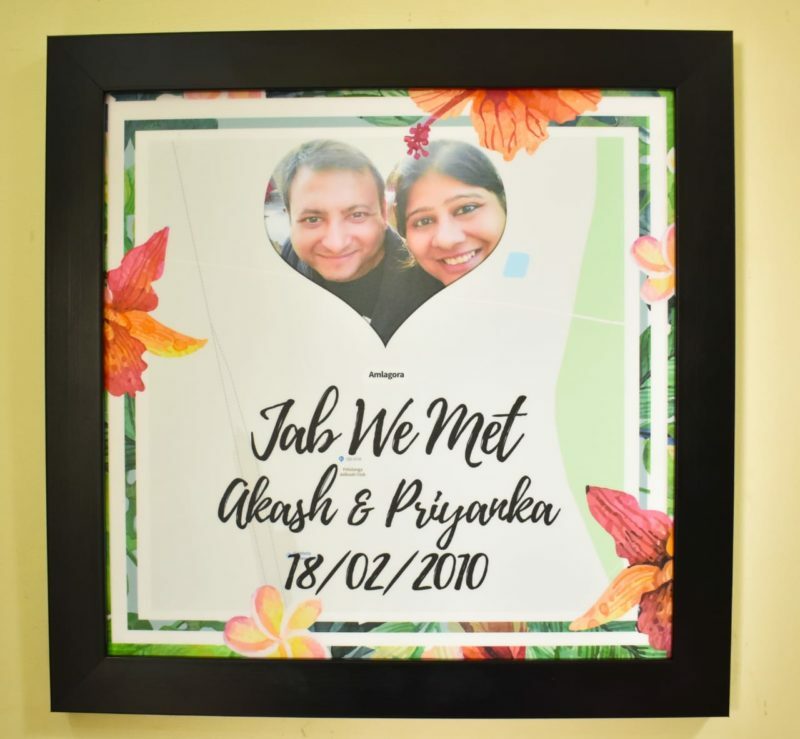 What is Jab We Met Photo Frame? The name Jab We Met says it all. It is a unique concept where you can add a couple photo mentioning the date and place you met. This moment is truly special for every couple. The concept is totally unique and amazing according to me. The Jab We Met photo frame allows you to capture the moment, add photographs and frame it forever. The photo frame is of size 12*12 perfect to be wall mounted. The matt black laminated frame makes the picture look more appealing. Not forget to enter the location where you first met in the map. You just need to mark the heart on that particular location. I met my husband in my hometown, I was amazed to find the place as well. In case you are not able to find the location or the location is not showing up on the map, you can enter the location or particular area. What do I like Most About InstamosaicStudio? The photo frame is no doubt a fabulous and unique concept. I have never come across something like this before. I am totally in for the innovative concept by the team. If you love personalized stuff, this is the best gift for your valentine this year. It was super easy for me to order the photo frame. You can get the image from google photo or your phone. Uploading the image is easy. Moreover, the website accepts payment via credit/debit card. You can also go ahead and do net banking as well. It hardly took 5 minutes and it was done. The best part is, once I placed the order, the team immediately pinged me on my WhatsApp confirming with the final image before getting it to be framed. I received Jab We Met photo frame well packed and secured in bubble sheets. I was extremely impressed with the overall quality of the final found product. To my surprise, I got the photo frame delivery within 10 working days. If you are a last-minute person. The InstamosaicStudio is the best choice. I am very happy with the purchase, totally impressed with the quick delivery time and quality product. The concept of Jab We Met is for all the couple who want to cherish beautiful time spend together. I would give thumbs up to this amazing photo frame. This photo frame is a great gifting option this valentine’s day to your loved one. Really very nice idea for this …. Gifting someone such a thoughtful and personalised thing would definitely make their Valentine’s Day special. It is a lovely concept. Very unique and lovely concept…. That is a really wonderful present for your significant other. I am certainly going to check this service out for Valentine’s Day. Thank you for sharing. Right post at the right time dear.. This is such an wonderful Valentine’s gift idea.. Now i need to check out to surprise my husband.. This is a good idea to gift our loved ones. I like the concept and it is the best way to store the memories. I will soon check out and will gift that to someone special. this is such an amazing concept. after going through your Instagram post I just ordered mine. It is a fab concept and amazing done photo frame I must say. Indeed the frame is beautiful and a must have valentine gift. I would say a lovely gift for newly wed couple too as at times we find less options to gift. That’s a very beautiful gifting option for the loved ones this Valentine’s Day. I will surely get one for my love. It’s always special when you give someone something customized and personalized, what better occasion than valentines day to use this opportunity which will show how much they mean to you. I have always loved to receive personalised gifts. I also try to gift people something that is customised. After all these gifts look very special. I loved yours too and will check out. Honestly saying I am a huge fan of photo frames too, they usually are a beautiful memory captured in a picture which we can see every day which sometimes helps s in the downs, loves this beautiful concept, I will definitely visit their website to see the options available.